Hoorah! The group made it past the plateau! 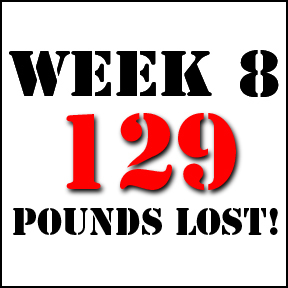 After a couple of lackluster weeks, the team put up an impressive number this week – 18.5 lbs down in just one week! That brings the total lost up to 129 lbs with just five weeks to go. This week’s loss goes to show that if you feel you aren’t making the gains you want, you just have to continue with the plan and push through. In looking at the group’s activity, it showed that many of them increased their exercise in order to make it past the plateau – some even doubled the distance they were walking and the amount of time they were spending at the gym. The vitamins and supplements do a great job of getting the body in the right set to lose the weight, but the work has to be put in to actually burn the weight off. We have been so impressed with the tenacity of the group over the past eight weeks. They have changed their eating habits to healthier foods – no more junk food in the cafeteria; they are all doing some form of exercise; and the chatter around the office is incredibly supportive and collaborative. We can’t wait to see what the next five weeks bring! This entry was posted in Home and tagged Healthy Weight. Bookmark the permalink.